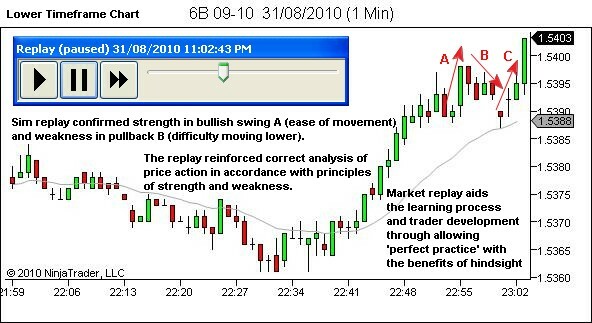 Recent articles on my session review process mentioned the use of a market replay feature. I’ve been asked for some information on this tool. Not surprising really – it’s something that most forex traders will not have experienced. Market replay is a feature that has appeared on many futures platforms in recent years. It allows you to replay the trading session in a simulated environment. Price bars appear tick by tick, exactly as they did when trading live. It will typically offer controls, as displayed below for play, pause and fast-forward, as well as a slide control to move to any particular chart time period. We are also able to re-enter and manage trades all over again, this time in a simulated environment. This is an ideal tool for implementing deliberate practice methods of learning. Our post-session review allows us to identify error within our analysis or decision making. The market replay then allows us the opportunity to re-trade our setups again with the benefit of perfect hindsight; reinforcing correct behavior, enhancing our intuitive pattern recognition abilities, and advancing us further along our path of trader development. Let’s look quickly at an example of the use of the market replay tool. 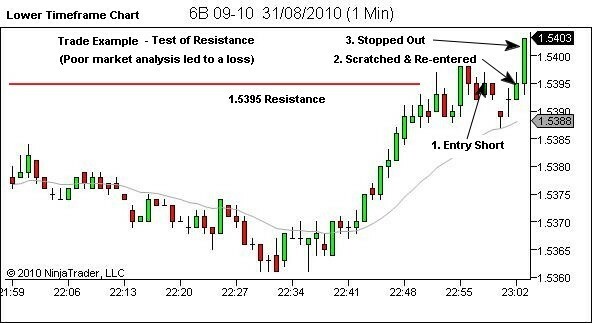 Without going into details of the analysis and decision making (that’s what the ebook is for), the following chart example displays a test of resistance. My expectations for a strong area of resistance lead me to largely ignoring the signs of strength and weakness within the price action, which should have warned me of this lower probability setup. I entered short, and despite a feeling of unease and further warning signs, plus a scratch and re-entry, I still managed to hold the trade for a small loss. The use of a market replay after the session allowed me to trade this setup again. I was able to start the replay a couple of minutes prior to entry in order to feel the bullish pressure that existed in swing A, noticing the ease with which price moved higher. I then experienced the difficulty with which price fell during swing B; and the stall (and failure to follow through) when price dropped to the swing low area. I also felt the ease with which price again moved upwards in swing C.
I did this again entering and managing in the same places as when I traded the original action, in order to feel how wrong it was. I then repeated the action with ‘perfect hindsight’ trade entry and management, entering long after the spring between swings B and C, where I should have reversed my original position. While the exact price action will not occur again in future (every setup is unique), many very similar situations will occur over the remainder of my trading career. Through taking these actions post-session, I have reinforced the lessons from this trade, as well as experienced perfect trade entry and management. And I have taken another small step forward in my development as a trader. If you don’t have a market replay feature, seriously… consider changing platforms! The example provided here is from Ninja Charts, but it’s certainly not the only provider. It’s the only one I’ve used, so I’m not qualified to comment on others. But, I believe a similar feature is provided by Sierra Chart, Open E-Cry, Ensign Windows and Investor RT (thanks Stan!!!). If you know of any others, please advise and I’ll add them to this list on the website. There is a difference in how the feature works through other charting applications. Some like Ninja require that you record the session data. Others allow you to download it from an archive. Similarly, there could be variations in the quality of data. So, don’t take my word for anything; carry out your own due diligence checks if you’re in the market for a new charting application. A year or so after first using market replay, it’s still a favourite tool of mine. It plays a part in almost every trading day – actually I can’t remember one in recent memory in which I didn’t use it. At the time of writing this article I wasn’t aware of any forex platforms which provided this tool, unless you accessed the forex markets through a futures platform such as NinjaTrader. This week, I’ve received email notification of a market replay tool that is available for forex traders, courtesy of YTC Newsletter reader Ivan. Thanks mate! I am going to purchase the Forex Tester, because it allows smoother testing/pausing/charting of results etc, and I can view the higher timeframe while testing. This is important because I always check the higher timeframe when deciding entries. NOTE 2: See the Forex Tester website for current prices. NOTE 3: Forex Tester 2 was upgraded to Forex Tester 3 in September 2016. The following have been recommended by YTC readers. Please note: They have not been checked by me for quality. Conduct your own testing to confirm suitability before purchasing! Reading your newsletter today, I saw your request for information about other platforms that offer replay. So in case you are unaware of it, just wanted to let you know that Thinkorswim by TDAmeritrade has this feature. They call it OnDemand. It allows on-demand replay of any day and any instrument (futures, equities, options, and forex) ranging back several years. OnDemand mode pulls data from their servers on demand. The user can specify dates and times, and also can fast forward and step through time at intervals. Because data is pulled across the network, it tends to startup somewhat slowly and also to pause occasionally to refresh data. Otherwise it is quite responsive. The platform is available free with a TDAmeritrade brokerage account. It does not connect with other data sources. Market replay is really good trick for studying, but it has one minus for stock traders. There are no available data at all! Some sites sell this data, but only last week data,so you can replay only last week sessions,and this is not enough. Do you know where it is possible to find Ninja Market Replay Data for stocks(NYSE, NASDAQ)?I am sure this is will be extremely useful for all stock traders.